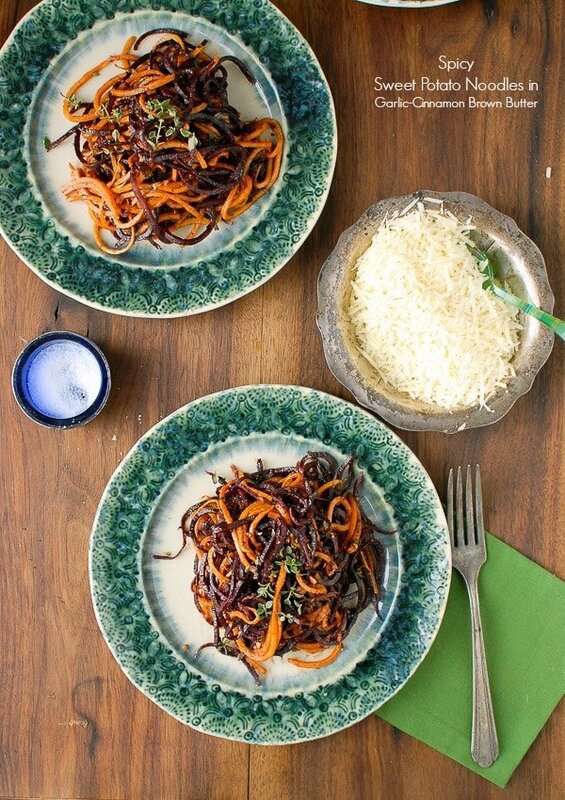 Spiralized vegetable recipes are as beautiful as they are delicious. Knowing how to spiralize vegetables will help you create any of these 10 healthy spiralized dinner recipes. This collection includes spiralized vegetable soups, salads, and main dishes. Learn how to make spiralized vegetables and spiralized fruit. Spiralizers make food fun! Great for gluten-free options. I’m really not one who is big on gadgets. 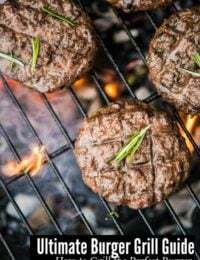 Like a magpie, I can befall that ‘bright, shiny thing’ temptation to purchase something new and unexpected for the kitchen, however often find it lacks luster when really putting it to work. I can think of three complete stand outs over my few decades of cooking. 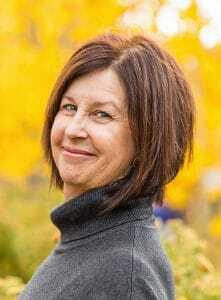 The first was a shrimp deveiner I found when living in California. It was a handy tool that allowed easily sliding between the top of a shrimp and its shell, then in one swift motion it separated the shell, removing the vein with it. The second is a corn kernel remover. It slides down an ear of corn with ease, removing all the kernels fully intact and not smashed as some tools tend to do. The last is my Spiralizer. I will admit I resisted at first. It felt like something from an infomercial, turning vegetables into noodles. I was sure there was a catch. It couldn’t be that easy. Would the vegetables really taste great? Could it be a good way to get more vegetables into our family diet? It certainly presented a fantastic option for gluten-free ‘pasta’. With a cost less than $30 I caved and bought one. And then began to give them as gifts. I love, love, love my Spiralizer. 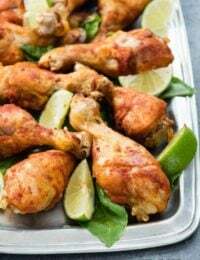 Between spiralizer recipes that rival traditional pasta, to soups, and salads, I have had the best time creating fun recipes. 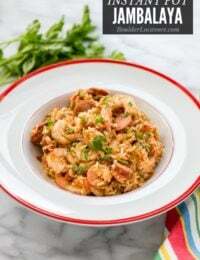 There is a whimsy about the spiral noodles and they have been some of my post popular recipes too! 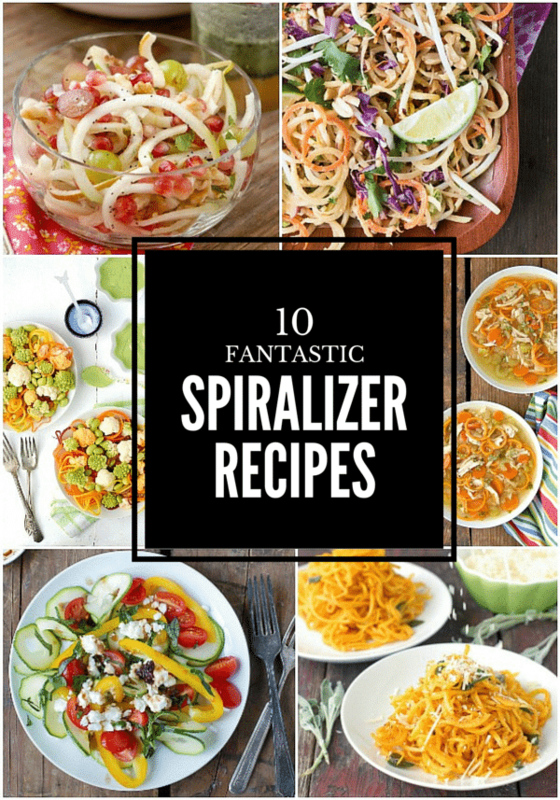 I’m sharing a collection of 10 Fantastic Spiralizer Recipes today to jumpstart your spiralizing at home. 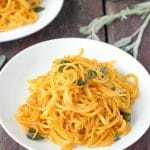 I feel sure you’ll find some spiralized vegetable recipes that you’ll love. If you don’t yet use a spiralizer, you’ll be shocked at how quick the recipes are to prepare and how tasty they are too! I’m asked often which Spiralizer I use so I’ll share that here too. I have a Paderno 3 blade Spiralizer which is available on Amazon.com as well as other locations. It does everything I need it to so and has been successful with every vegetable and fruit I’ve processed. 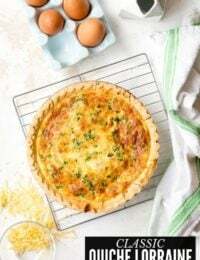 For those on Pinterest I have a collection of Spiralizer Recipes from the internet you will love too! 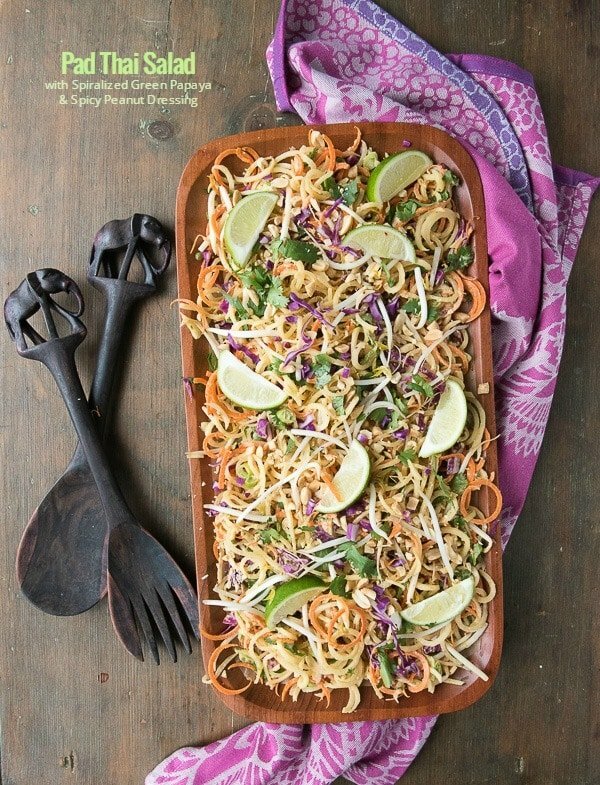 Pad Thai Salad with Spiralized Green Papaya and Spicy Peanut Dressing. This exotic, colorful salad brings forth the favorite flavors in a traditional Pad Thai dish in salad form complete with ‘noodles’ thanks to the Spiralizer. Cucumber and Melon Spa Salad. There has never been a more refreshing salad. 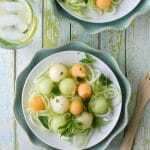 Keeping it light and simple, melon balls compliment a bed of spiralized cucumber noodles with a light dressing. Great for getting ready for bikini season as well! 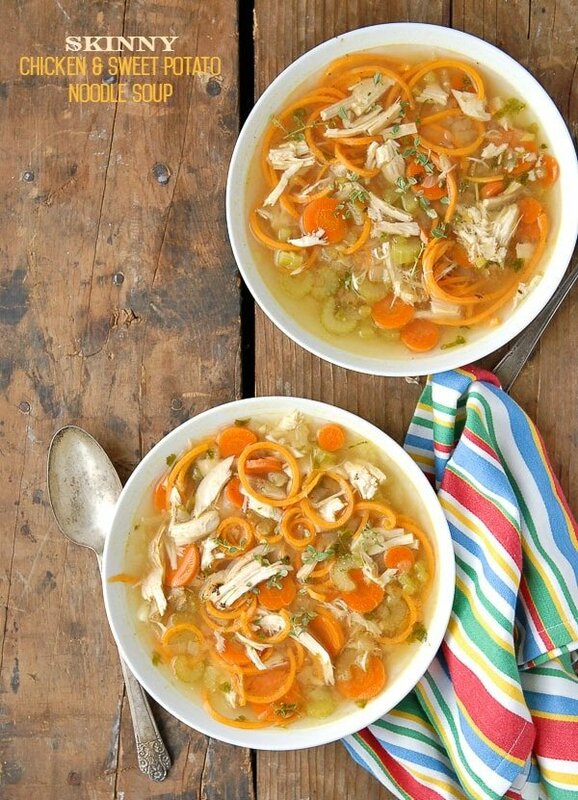 Skinny Chicken and Sweet Potato Noodle Soup. A homey, comforting soup substituting sweet potato spiralized noodles for the pasta classic. You’ll want to eat this every day! 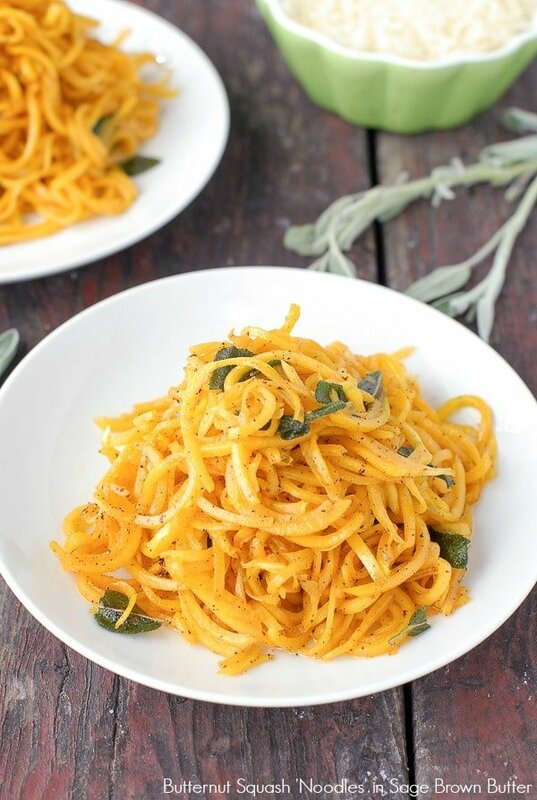 Butternut Squash Noodles in Sage Brown Butter. One of Boulder Locavore’s most popular Pinterest recipes, these simple noodles are full of flavor and snap to whip up. 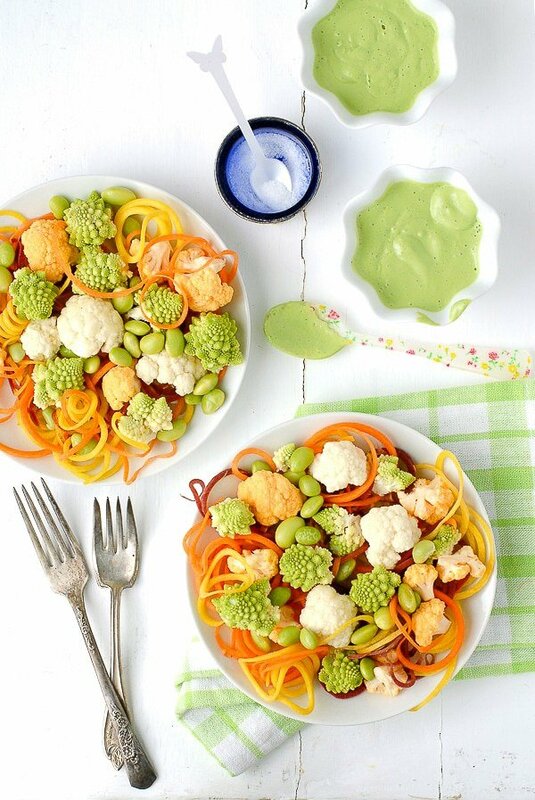 Spiralized Spring Salad with Buttermilk-Green Goddess Dressing. Ok, full disclosure on this recipe, I had to scramble to come up with a seasonal name for the salad. 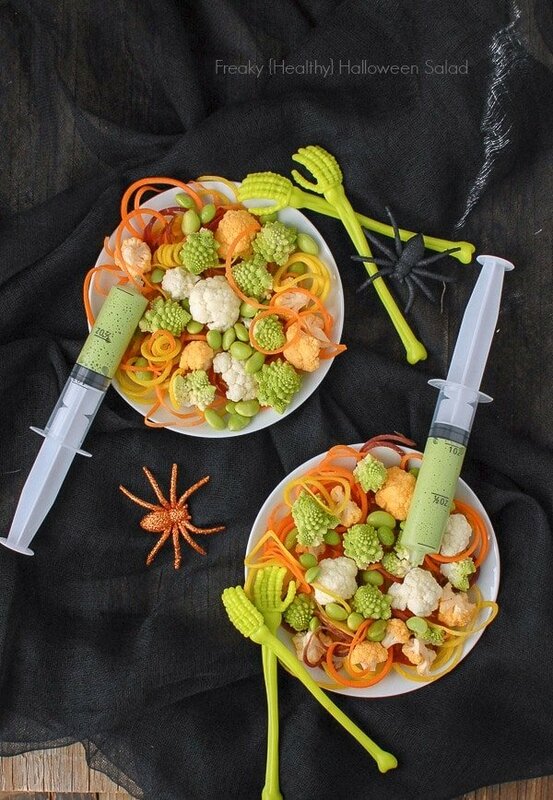 Originally I created it as Freaky Halloween Salad, as the odd shapes made a healthy compliment to the sweets of that holiday (with the dressing served in syringes too). But it’s too good to be isolated to that season. Perfect for this time of year too, it’s a feast for the eyes and the palate. Zucchini Ribbon Mediterranean Salad. 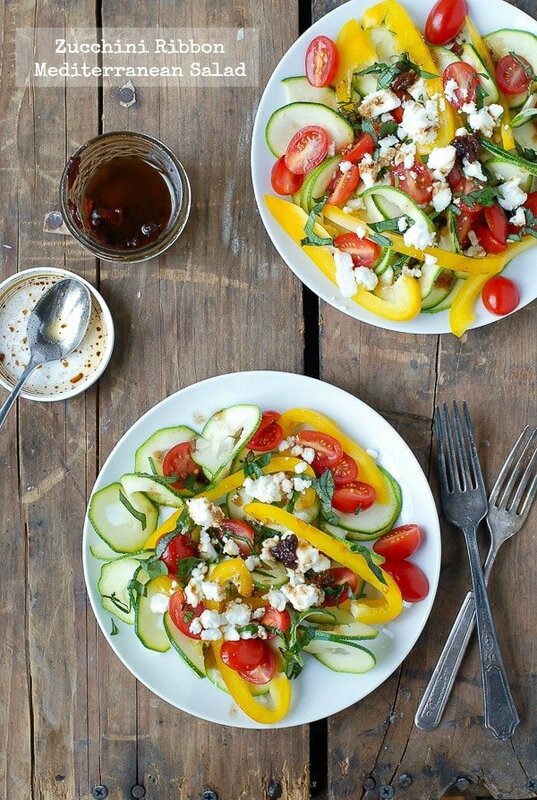 Everything you love in a Mediterranean salad: tomatoes, pepper, feta cheese, sundried tomato and spiralized zucchini. 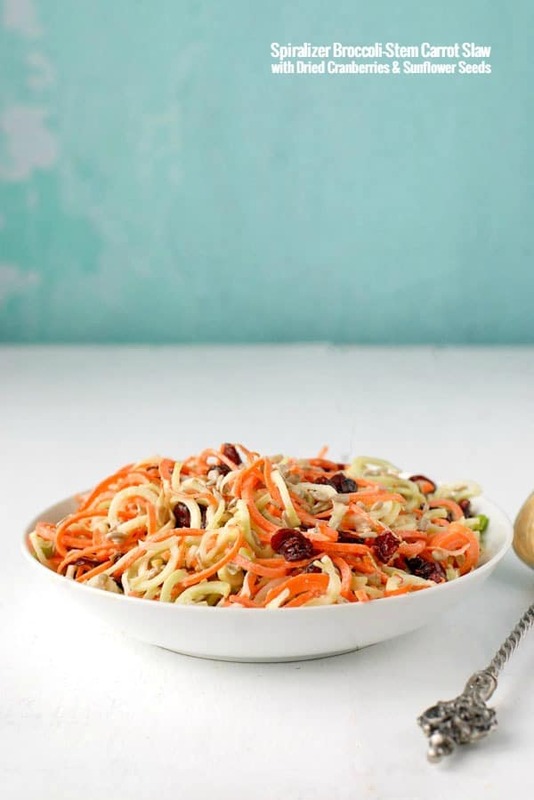 Spiralized Broccoli Stem-Carrot Slaw with Dried Cranberries. Sadly broccoli stems get the short end of the stick. Once their tough exterior is removed, they have a delicious flavor and crunch. This slaw is a perfect way to put them to use instead of tossing them out. After trying it you may be tossing out the florets next just to eat the stems! 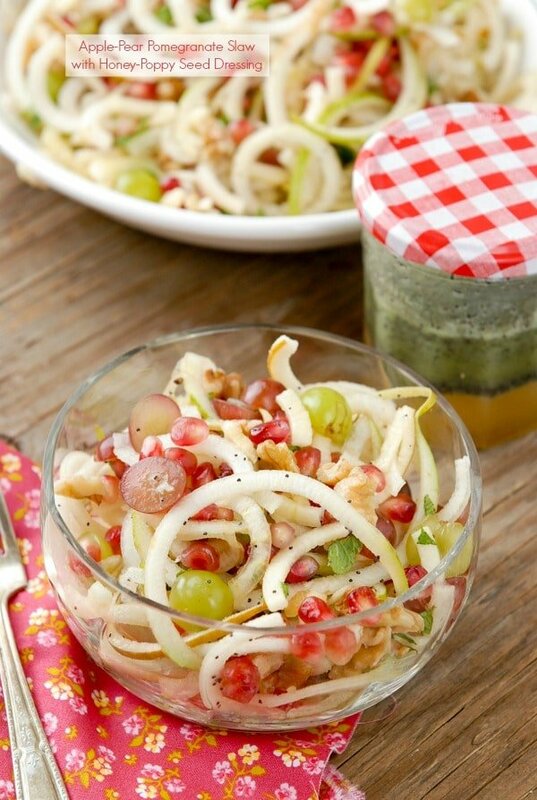 Spiralized Apple-Pear Pomegranate Slaw with Honey Poppy Seed Dressing. Another Pinterest power pin, this salad is refreshing, flavorful and has a great texture and crunch too! 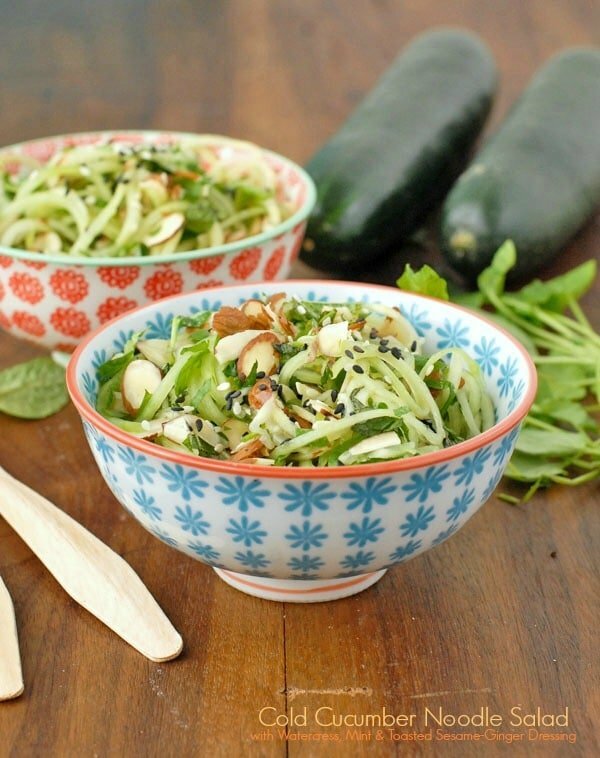 Cold Cucumber Noodle Salad with Watercress, Mint and Toasted Sesame-Ginger Dressing. 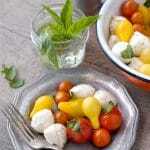 I love this salad especially in the summer. It’s fresh, light, refreshing with an Asian touch. Spicy Sweet Potato Noodles in Garlic-Cinnamon Brown Butter. A soul-warming dish of flavorful sweet potato spiralized noodles in a garlic-cinnamon brown butter that is out of this world! Yum! This reminds me that I really need to use ,y spiralizer more. Feeling very inspired right about now. 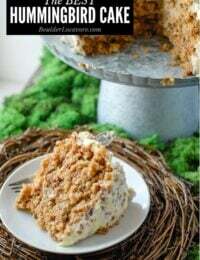 These look like some really fun and yummy recipes! 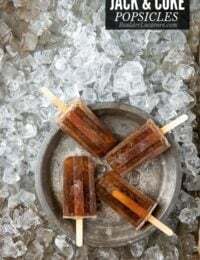 I would love to try some of these. I am so pinning this post! I just got a spiralizer and am in need of some inspiration. The thinner the better as far as the kids are concerned, when it comes to veggies. This is a great invention! How have I not heard of a Spiralizer before? I really want that Cucumber Melon Spa Salad right now. It sounds so great for spring and summer. Oh my goodness! 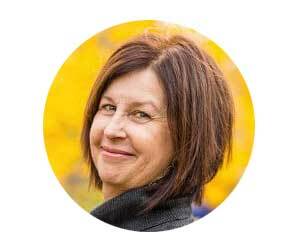 I can’t believe you’ve escaped the craze in the past year Dawn! They are really fun to use and inexpensive as far as most gadgets go (less than $30). It’s a great way to get more fruits and vegetables into your diet. I have one and haven’t played around with it yet. What am I waiting for? These ideas are awesome! At first i thought it was an pasta. Lol but it looks good and delicious! Glad you shared this post. Ok you’ve got me sold. I had been holding off, wondering how often I’d really use one. But these 10 alone have me NEEDING one. I actually just got a spiralizer and have not used it yet. That Pad Thai Salad looks amazing!! I have been wanting to explore the world of zucchini noodles but had no idea a spiralizer could be so versatile. That beautiful slaw is calling my name! All of these recipes look yummy. I can’t wait to make the Cucumber and Melon Spa Salad. I love my spiralizer and don’t use it often enough.. 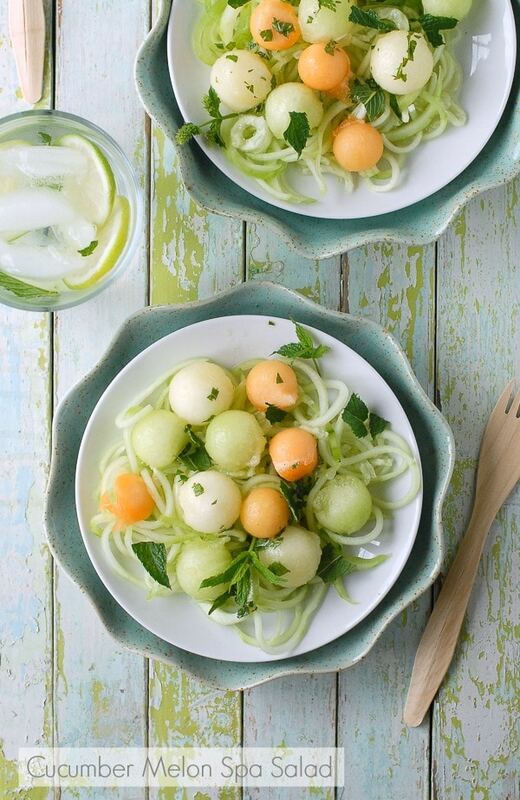 Thanks for sharing all of your delicious recipes using a spiralizer! 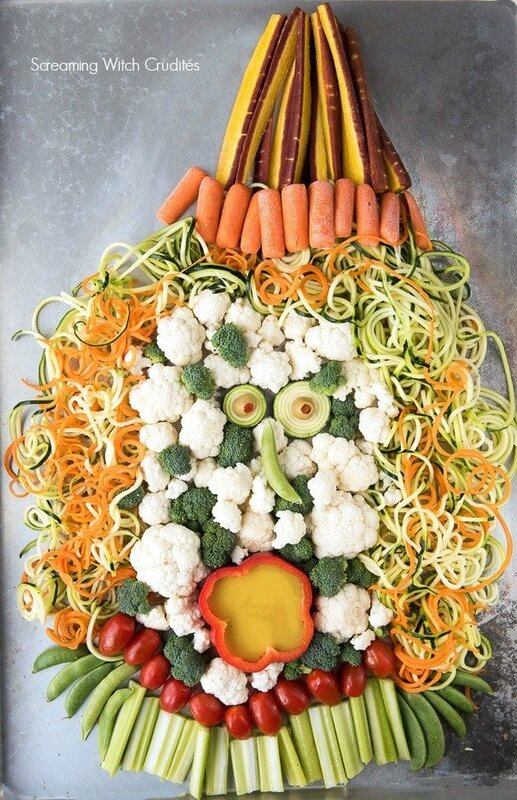 My daughter has celiac disease and loves using spiralized veggies as a healthy alternative to pasta. I have been thinking of getting a spiralizer for myself! What a cool article. I’ve never actually seen a Spiralizer in action. I had no idea you could make so many dishes with it. Thanks for sharing this. I think I would love the Cold Cucumber Noodle salad, Toni. Sounds delicious.